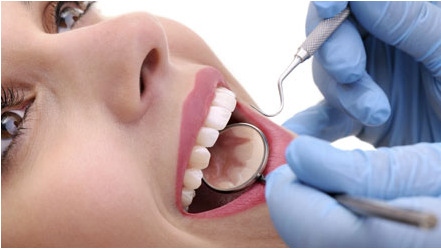 Gum disease is a serious infection of the gum tissue that can damage the jaw bone structure. It is a progressive disease that often goes unnoticed. Fortunately, the build-up of bacteria and plaque can be kept under control by thoroughly brushing and flossing daily, as well as attending dental checkups and cleanings twice a year. These actions will limit the spread of gum disease. 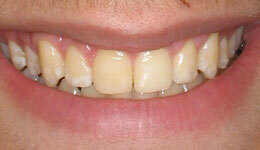 Gingivitis is actually very common in adults. It is the mildest form of gum disease and involves slight inflammation of the supporting tissues surrounding the teeth. In mild cases of gingivitis, most people are completely unaware they have it. 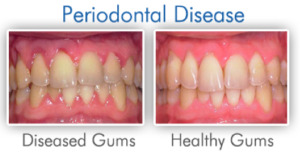 However, if gingivitis is left untreated, it can rapidly progress to more advanced stages of periodontal disease, causing many other problems in the mouth. 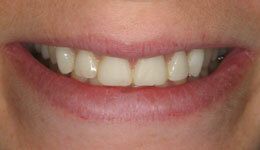 In this case, treating advanced gum disease can become more complicated. Healthy gums hug the teeth tightly to protect the roots and the nerves from being exposed. Advanced gum disease weakens and destroys this gum tissue, leaving the roots and nerves vulnerable. In addition, diseased gum tissue does not provide enough support for the teeth. 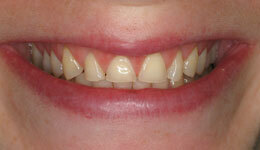 This is why advanced stages of gingivitis can sometimes result in loose teeth or the complete loss of a tooth/teeth. Gum surgery is often used to treat gum disease, and it typically involves cutting away diseased gum tissue in order to stimulate the growth of healthy tissue. 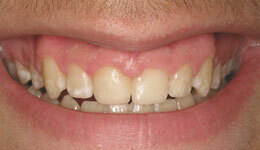 In some cases, a gum graft is necessary to replace healthy gum tissue. Because gum surgery involves the removal of (and sometimes grafting of) tissues, it can be an invasive and discomforting process, involving incisions and sutures (stitches). Luckily, technological advances in dentistry have made other less invasive gum disease treatments available, like laser gum therapy. Laser gum therapy is a minimally invasive and highly effective means for removing bacteria and diseased tissue from the gums. LANAP laser gum treatment aids the gums in reattaching to the teeth to close pockets and shut out bacteria to prevent further disease. Laser gum surgery has revolutionized gum disease treatment and has also opened up the field of periodontal plastic surgery, a collection of cosmetic gum treatments to improve the aesthetics of a person’s smile. Our team of experienced cosmetic dentists are here to help you determine the best treatment plan for curing your gum disease. Don’t hesitate to fix those bleeding gums, your gummy smile, or to find out more about our deals on teeth cleaning. Call our top-rated New York City dentists at (212) 851-1091 or fill out this form to book your free periodontal consultation.